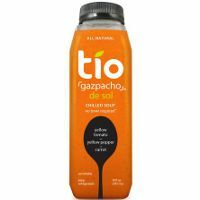 Tio is a new concept in refreshment and nutrition. We bring all the flavors and health benefits of Mediterranean eating to American consumers with a line of drinkable gazpachos. Only the finest ingredients go into our products, like raw veggies and organic extra virgin olive oil. They are never heat pasteurized and always gluten free.